The Pacific Southwest Railway Museum, located at 750 Depot Street in Campo, California, is about an hour east from San Diego. This off the beaten track museum is a must-see destination for railroad enthusiasts and for families seeking a memorable day trip. 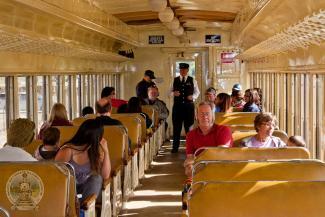 Take a scenic ride in a historic refurbished train car through the mountains and desert. The Pacific Southwest Railway Museum (PSRM) is a non-profit that was started as the Railway Historical Society of San Diego by Eric Sanders and Douglas Duncan in an effort to preserve the San Diego Electric Railway streetcar system that was being dismantled in 1949. By 1964, the organization formally incorporated as the Southwest Railway Museum Association and they began to solicit donations of locomotives, railcars and other historic exhibits to realize their goal of creating a museum where visitors could look at vintage trains in various stages of restoration and go for a ride as well. By 1977, the collection had grown to include a retired wooden business car and steam locomotive from the Southern Pacific Railroad that operated from 1907-1919, the former Santa Maria Valley Railroad (Central California) 12-passenger gasoline railbus No. 9, a saddle-tank 6-wheeled steam locomotive No. 3 retired in 1923 from Mojave Northern Railroad, the "Shay" logging locomotive No. 3, and the former 1941 outside-braced Akron, Canton & Youngstown Railroad wood boxcar No. 3024. In 1978, they acquired the remains of the former San Diego & Southeastern Railway wooden La Mesa, California railway station. Volunteers restored this 1894 gem to its 1915 appearance as a public museum. In 1980, the museum was forced to relocate to Campo. This new location was perfect because of the surrounding scenic terrain and the proximity of railroad tracks, as well as the fact that it is only 50 miles east of downtown San Diego on State Route 94. In 1983, the restored La Mesa depot was opened to the public as a museum. As the museum continued to develop in its new home, volunteers were busy salvaging tons of original historic material from the former SD & AE Yard Office before it was demolished. The collection continued to grow to include steam and diesel locomotives, Pullman-built electric commuter coaches, a chair car and many other items. In 1987, the museum's first passenger train ran from Campo to Tecate, Mexico, making it the first and only non-profit operating railway museum to operate its trains across an international boundary. Unfortunately due to a tunnel collapse in mid-2009, the Desert Line service was indefinitely suspended. According to a September 2017 report, the Desert Line is slated to be restored, so service can be re-established. For updates on the progress of this line, visit the BJRR website. With the help of the California legislature, a new building was erected at Campo to house the growing collection. In addition to an extensive library, special events, walk through trains and displays of railroad memorabilia, the museum offers a variety of vintage train rides throughout the year and special hands-on programs like Engineer for an Hour. The mission of this living history museum is to preserve the historical, social, economic and technical impact of rail transportation with a special emphasis on the railroads of San Diego County in addition to the railroad systems that connect it with those in Mexico and other states and cities in the US. The focus of the collections strive to educate and entertain the widest possible audience about railroad heritage. The library offers a large selection of private railroad documents and railroad related books. The collection includes 9,000 volumes in a myriad of subjects from engineering and catalogues to technical works and journals of historic societies. In addition, railroad researchers and enthusiasts will find a selection of official railway guides from 1900 to the present, magazines from the 1890 to the present, records, maps, blueprints, timetables, registers, railroad art and assorted ephemera from a wide variety of sources. The train roster found on the museum's website details the types of trains owned and displayed at the museum. The online roster includes details on steam locomotives, diesel locomotives, cabooses, freight cars, passenger cars and support equipment like rail cranes, a turntable and a motorcar. 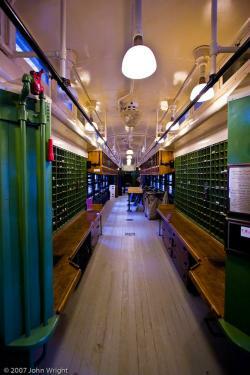 In the museum building, you will find four trains to walk through along with detailed historic information. Outside there are even more trains to explore, but be careful of wasps. There is also a chronological history of the San Diego railroad at the station as well. 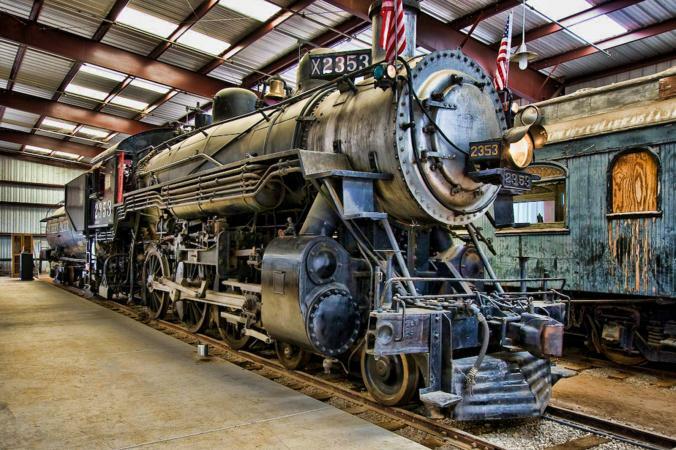 The Pacific Southwest Train Museum runs trains year-round with different seasonal schedules as well as special holiday trains and even a Sunday train engineer day. The operating hours of the Pacific Southwest Railroad Museum vary based on the season, so check the website to verify hours and special excursions. Train ride options range in pricing depending on the duration and the type of excursion chosen. The train exhibition on the grounds is free and open 24 hours a day. The Depot and Docent tours take place on Saturdays from 1 p.m. to 4 p.m. If you have always wanted to ride in the locomotive cab with the engineer and crew, book a special "cab" ride ticket to experience what it is like behind the scenes. There are only two people allowed in the cab at one time and the most any train ride can accommodate in one trip is four people, two in the cab on the departure from the depot and two on the return trip. Cab riders must be six years or older and those under 18 must be accompanied by a paid cab rider over 18. Cab riders must wear closed-toed shoes. It is best to check the calendar to see which excursions offer cab rides and to book them early. 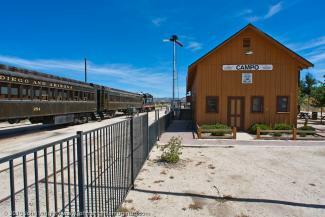 This one-hour, 12-mile round-trip rail ride on the historic San Diego & Arizona Railway operates on weekends between Campo and Division. Along the way, passengers will enjoy the rugged surrounding countryside as the train travels toward the Mexican border, crosses the Campo Creek Viaduct and enters into International Tunnel #4. If you are lucky, you may even be able to ride in the cab and blow the train whistle! The best views on this trip are on the end of the train and at the open door box car. Another highlight of this ride is the chance to see the U.S./Mexico border fence. Golden State Excursion tickets are free for infants and toddlers including those under three held in an adult's lap, $9 for children ages 3 to 12, adults ages 13 to 64 are $18 and seniors 65 and over are $15. Cab rides are $40 per person for ages six and up. This train runs Saturdays and Sundays at 11 a.m. and 2:30 p.m. This 30-minute ride on the Missouri Pacific Caboose #13936 connects the Pacific Southwest Railway Museum's Display Building and the Campo Depot with the Mountain Empire Historical Society's Gaskill Brothers Stone Store Museum located in the mountain desert back country of the San Diego County Park system. The exhibit halls of the Stone Store Museum contains exhibits of Kumeyaay artifacts, a pioneer display dating from the 1800s, a military display and a bookstore. This ride, that runs every 30 minutes from 11 a.m. to noon and from 1:30 p.m. to 3:30 p.m., is a perfect way for passengers to take in some desert scenery, tour the museum grounds by rail and explore the Gaskill Brothers Stone Store Museum. Valley Flyer tickets are free for infants and toddlers including those under three held in an adult's lap, $7 for children ages 3 to 12, and adults ages 13 and up are $14. To ride with the engineer in the locomotive, ages six and up is $25 each. At special times during the year, the Pacific Southwest Railroad Museum offers the chance for individuals to operate a vintage diesel locomotive with one of the San Diego and Arizona Railway's qualified engineers. Sound the horn, ring the bell, feel the power of a real diesel locomotive as you inch up the throttle and then bring this iron beast to a stop using the train's air brake system. One of two trains is usually used-the Southern Pacific GP9 #3873 or the San Diego & Arizona #7285-and reservations are required. The Engineer for an Hour experience is available on Sundays at 10 a.m., 11:30 a.m., 2 p.m. and 3:30 p.m. Tickets are $150 for members of the Pacific Southwest Railroad Museum and $175 for non-members. If you want to book a memorable private event experience for your group, family, friends or business associates, the museum rents two private luxury cars, the pullman Robert Perry and Santa Fe Cafe-Lounge #1509, as well as the Missouri Pacific Caboose #13936. Private charter fares for the Missouri Pacific Caboose #13936 are $200 for the first 10 passengers with a maximum of 15 people. The Robert Perry, built in 1929, is $425 for up to 15 people, and additional passengers can pay the standard fare with a maximum capacity of 20 people. The elegant Santa Fe Cafe-Lounge #1509 that was used for many beginning in 1929 on the trip from Los Angeles to Chicago, Phoenix, and Kansas City is $650 for up to 30 people; additional passengers pay the standard per-passenger fare. The car's maximum capacity is 37 people. Perfect for family fun, festive holiday trains include the "Bunny" Train, Pumpkin Express and the North Pole Limited. The Bunny Train is offered around Easter and travels along the 12-mile track through San Diego's beautiful desert and mountain landscape. The train ride includes at visit from the Easter Bunny and an Easter Egg Hunt. Bunny Train tickets are $5 for infants and toddlers including those under three held in an adult's lap, $14 for children ages 3 to 12, adults ages 13 to 64 are $18 and seniors 65 and over are $15. Trains run at 10 a.m., 12:15 p.m. and 2:30 p.m. Cab rides are $40 per person for ages 6 and up. The Pumpkin Express excursion takes place annually to celebrate Halloween. Rides are offered during the month of October. After a scenic hour train ride in a vintage train car decorated for Halloween thrills and chills, passengers are dropped off at the display building where they can explore two haunted trains, a pumpkin patch and interact with a "spooktacular" cast of ghosts and ghouls. Fares are identical to the Bunny Train. North Pole Limited takes place in the month of December. The fun for young and old alike begins at the beautifully decorated Campo Station. Once on board the 1920s vintage commuter train, Santa's elves will pass out cookies and hot chocolate, sing carols and tell stories that are sure to entertain and delight. The highlight of this excursion is the stop at Santa's Workshop to pick up Santa and Mrs. Claus who will visit with all passengers on the way back to the Campo Depot. Coach fare is $10 for infants and toddlers including those under three held in an adult's lap, $25 for children ages 3 to 12, and adults ages 13 and up are $35. First Class tickets are $10 for infants and toddlers under three, $40 for children ages 3 to 12, and adults ages 13 and up are $50. Cab rides are $40 per person for ages 6 and up. Trains run at 10 a.m., 12:15 p.m. and 2:30 p.m.
A special North Pole Limited Charter can be arranged by renting the entire Robert Peary car for $1,200. This luxurious travel treat includes a hot chocolate and cookie service, complimentary soft drinks and candies along with larger seats, more legroom, and an elegant old world atmosphere. The catch is that individual tickets are not sold and the entire car must be purchased. This car can accommodate up to 20 people. Most reviews on TripAdvisor note that this destination is well worth the visit. Out of over 20 reviews on TripAdvisor, nearly all were "excellent" or "very good" with comments such as "amazing trains from the past," "great museum, great train ride" and "so worth the drive." Seasonal special event trains were also highly rated with comments like "fun on the pumpkin express" and "fun with the Bunny." Although there is no Groupon voucher available as of this writing, hundreds of Groupon users recommended the Pacific Southwest Railroad Museum. The overwhelming majority of Yelp.com reviews are also positive. Several reviews recommended the Limited Polar Express as good family fun. Keep these helpful insider tips in mind to optimize your time at the museum and to avoid disappointment. Before you go, check the train schedule online to make sure the trains are running when you plan to visit. Remember to check out the type of train that is running; different trains run at different times. Reserve early if you want a cab ride. There are only two cab ride spaces available per trip. For special event trains, it is best to book your tickets before you arrive. Purchase tickets early for the North Pole Limited train as it sells out quickly. For the North Pole Limited Train, arrive 45 minutes in advance to allow ample time to park and enjoy the museum. Bring your camera for memorable photos and try to board first to snag a window seat for photos. All trains departing from the Campo Depot are wheelchair accessible, but cab rides are not wheelchair accessible. The gift shop offers a myriad of train related items as well as snacks, water, drinks and candy. Picnic and children's play areas are on the grounds and picnics are permitted. A fun thing to do on the 12-mile train ride is to count the number of border patrol agents you can spot in the hills. After the train ride, you are dropped at the display building and have to walk back to your car. Regardless of whether you are a railroad enthusiast, lover of history or looking for a family fun adventure, your visit to this historic gem is sure to entertain. The highlight of the day is to ride the rails through the rugged scenic backcountry hills of San Diego County on a vintage railroad car and imagine what life was like when these railroad cars were in their heyday.